Read the latest blog posts by Letterpress Made, a letterpress wedding invitation and custom baby announcement design studio. Like it or not, it seems that Game of Thrones is here to stay. For those of you who don't know what we're talking about or just aren't a fan, we apologize for the digression and check back with us next week. But for those of you who live and die by the creed of "Winter is coming," well, you're in for a real treat. 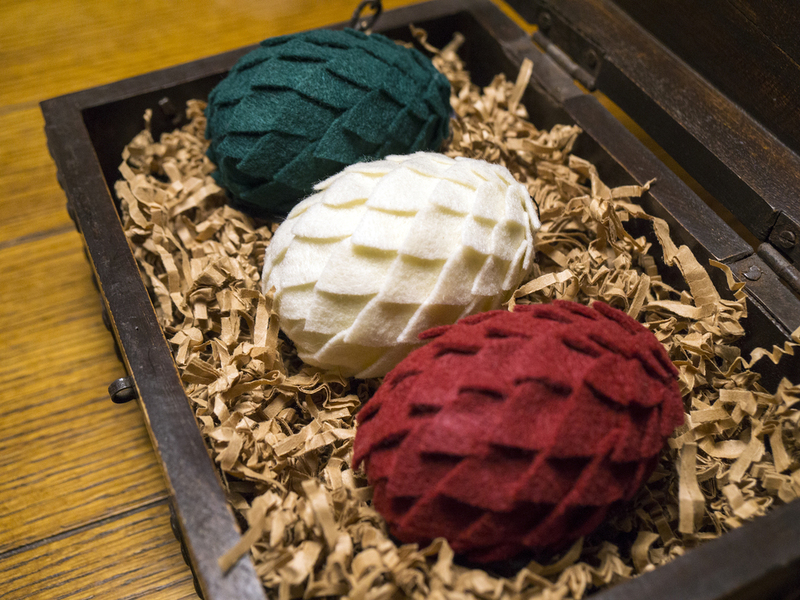 Today we're going to take you through a step-by-step tutorial on how to create your own Game of Thrones themed ornament(s): Khaleesi's dragon eggs. We actually think this would be an epic proposal idea for those die-hard fans out there. Simply hide the ring around the neck of one of the dragons inside the egg, or a "Will you marry me?" note, etc.--you get the idea. Please, please, PLEASE let us know if you actually do this, we would LOVE to see pictures! :) We'll be adding pictures and posting this on Instructables in the next week or two, so look out for an updated post. Here we go! Print your paper template and cut out. Make sure to print it at 100% so they are the correct size. We included 2 of each size scale just in case you accidentally cut off the tip of one while making them out of felt, then you won’t have to reprint the entire thing. a. One option is to cut them directly out of your full 9x12 felt sheet. However, the method we found works best is to first cut your felt into little rectangles using your scissors or rotary cutter and then cut your scales from those as the large felt swatch can be a bit unwieldy for pieces this small. Make sure you save a strip of felt large enough to cut out your wings. b. Simply hold the scale template with your non-cutting hand on the felt and carefully cut around it with scissors making sure not to cut the paper in the process. c. You will need approximately 50 small scales and 45 large scales of each color. Yep, it’s going to take a while. Cover egg in double-sided tape using the pattern we’ve provided here, or however you want. The reason we’re using mostly tape instead of glue is because it will come out neater. Those hot glue guns leave a lot of strings and goo that will be hard to clean off of felt. Plus it will allow you some play in scale placement. If you’re confident in your scale application ability and you prefer to glue the entire thing then go for it. Additionally, we chose not to use the felt with the already sticky back because we knew we were going to overlap the seam of the egg and therefore couldn’t use it in that row. We didn’t want those seam scales sticking out if the others were going to be completely flat so making the whole thing out of regular felt was the best option. Cut an 8-inch piece of ribbon. Set aside. a. First row: Start by applying 5 small scales to the center of the bottom half of the egg in a star pattern with the points facing in. You will be applying all the scales with the points facing the bottom of the egg. b. Second row: 5 small scales on the overlapping areas of the first 5. Fill in with 5 more scales between those. c. Third row: Large scales side by side and with an overlap on the previous row. Do your best to plan it out so that the rows are of somewhat consistent spacing. Also, it is better to overlap them side-by-side-than to have too much room between them. The amount of scales you will use will depend on your spacing and the size of your egg. The tape is strong, don’t worry about it if some of the scale is not touching tape. d. Fourth row: Large scales. This row should be reaching the seam of your egg. Make sure these are just beyond the edge of the egg (about 1/16th of an inch) so that the plastic doesn’t show too much when your egg is pulled apart. e. Fifth row: Large scales. This should be the first row on the top half of your egg. This will probably be your largest row as it will be on the widest part. f. Sixth row: Large scales. g. Seventh row: Small scales. h. Attach ribbon to top of egg like this illustration. Places two small pieces of tape over each “foot” of the ribbon. j. Ninth row: Small scales. k. Tenth row: Take 5 small scales and overlap and glue them in a flower/star shape with points facing out. Use this illustration as a guide. Make sure that each scale is both underneath one of its neighbors and on top of the other neighbor. l. Push your ribbon loop up through the center of this star and glue down to complete your egg. If you have a dragon to put in your egg, now’s the time. If you’re making your own out of a lizard follow the steps below. a. Paint your lizard whatever color you want. b. Fold the strip of felt for your wings in half the short way. c. Place wing template on top of the folded felt with the short, flat side at the fold. d. Hold and cut around the template like you did with the scales. When unfolded, you should have long, connected wings. e. With the wings folded in half still, put a strip of hot glue on the edge of the fold and press onto the back of your lizard. Put your dragon and/or engagement ring or “Will you marry me?” note inside of one of the eggs. You can also have something special in each egg and make sure s/he opens them one by one and in order--i.e. “I love you” in one, “Will you marry me?” in the next and the ring in the third. Go nuts and have fun! Then start planning your GoT themed wedding!